Additional Info: The biopsy was taken from a middle-aged woman with altered bowel habits (classically, "watery diarrhea"). As is typical for microscopic colitis (collagenous and or lymphocytic colitis), nothing remarkable was seen at colonoscopy. Some authors believe that lymphocytic and collagenous colitis are different temporal manifestations of the same disease. The illness is steroid-responsive. 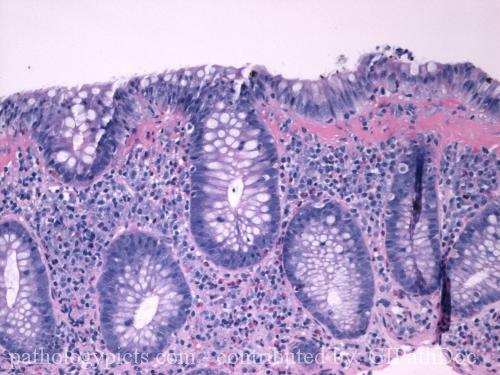 Note the increase in plasma cells in the lamina propria, and the increase in epithelial lymphocytes, along with the thickened subepithelial collagen layer.